President Yoweri Kaguta Museveni, presented shs1.7bn to two women savings and credit cooperatives in Kampala at the women’s day celebrations for Kampala District, held at Kololo independence grounds. 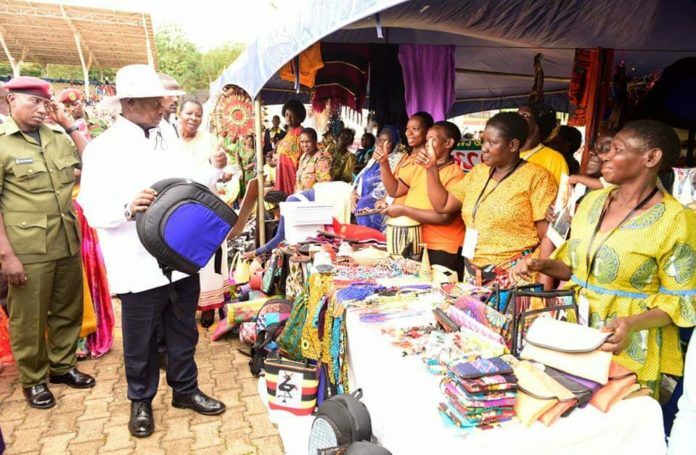 Museveni on Wednesday 11th April 2019, during these celebrations gave out 1.3bn cheque to Community Driven Development (CDD) SACCO while Uganda Women Entrepreneurs Programmes (UWEP) received 417m to set up more development ventures. He says government support programmes like NAADS and Women funds are meant to empower and develop people particularly women and youth to improve their livelihood and drive them out of poverty. But he said he has a new strategy of delivering the funds to the intended groups because he has learnt that the funds don’t reach as expected. Museveni said the new formula he has drafted, will deal directly with people who have income generating activities and have formed their own groups or SACCOs. “For example hairdressers are registered from parish level to district level and have one SACCO. This can easily be supported by government and myself. He however, agued women and youth to venture into economic activities that have both local and international markets, for them to be able to generate quite a reasonable amount of money. Museveni proceeded to point out some activities that include craft making and furniture making. He says these have markets both internationally and locally and will help them earn good money and eventually kick out poverty. Kampala people are poor because they vote wrongly. According to Museveni, Kampala people are still poor because of their poor choices as regards to leaders particularly opposition players who concentrate on criticizing what government does and forget to lobby for the people they lead. He gave an example of MP Lubaga North Moses Kasibante and Kato Lubwama MP Lubaga South Constituency. Museveni adds despite of the mistakes done earlier, the people of Kampala now know what they are supposed to do when it comes to voting. He also vowed to continue supporting women groups and SACCOS after their details are submitted to the president’s office. Since 2018, president Museveni has offered over shs10bn distributed to various youth and women SACCOS around Kampala aimed at eradicating poverty among Ugandans. Next articleDo U Think Uganda Needs More Fresh Kids Than University Graduates?